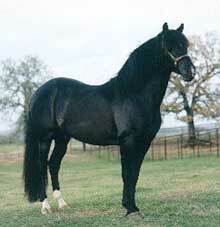 The Peruvian Paso was bred from Spanish stock brought to South America by the conquistadors in the 1500's. The people of this area need a horse that would be easy to ride for long distances over high mountain terrain. During the Middle ages, the Barbs and Palfreys bred in Spain were considered the finest and most beautiful in the world. They were called Spanish Jennets and when Spanish nobelmen first settled in South America and the Caribbean Islands, they took many of these prized horses with them. Today, the descendents of those early Spanish Jennets are known as Paso Finos and Peruvian Pasos. The Peruvain Paso, one of the world's last remaining naturally gaited breeds, is becoming very popular among American horse enthusiasts for several good reasons. This horse provides riding comfort, strength and stamina for the avid trail rider and has a calm disposition. Its flashy presence and gait have a natural tendancy to set the exhibitor and parader apart from others. No special training is necessary to enable the Peruvian Paso to perform its specialty - a natural four-beat footfall that provides a ride of incomparable smoothness. Peruvian Paso horses come in all basic, solid colors as well as greys and roans. The breed, because of its direct link to the Barb horse, has some striking color tones and shades. The average height of the Peruvian Paso is between 14 and 15 hands and the weight is commonly between 900 and 1,100 pounds, about the same as Morgans and Arabians. Although some outside blood was occasionally added to gain size, usually Arabian, Morgan or American Saddlebred, the modern Paso Fino is a close representation of the old Spanish Jennet and still can be thought of as one of the world's most coveted palfreys. There is probably no smoother horse to be ridden than a Peruvian Paso or Paso Fino. Read the next horse breeds article on Tennessee Walking Horse.